Florentine means to be served with spinach, and its name would imply that it’s from Florence, yet I’ve never seen it in any restaurant in my travels in Italy. I would guess it is a variation on Fettuccine Alfredo, which is a wonderful dish. I like the freshness of the spinach and feel it adds an interesting contrast to the cream. This perfectly blends the cream, butter and freshness of the spinach to create a wonderful meal. 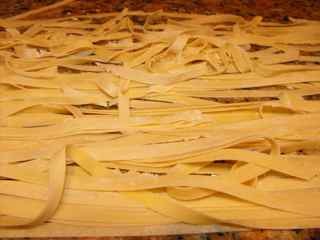 Prepare the fettuccine as directed, but make sure it’s leaning towards very al dente. Drain pasta add a little butter, mix and set aside. Melt the butter in a large sauté pan and when hot, add the chicken and green onions and sauté until almost done. Add the spinach and wilt it for a few minutes and then add cream and bring to a boil until it thickens. Add in the cooked fettuccine, Parmesan cheese. Toss thoroughly and serve immediately. This would be perfect served with a Sauvignon Blanc.